The Donut Experiment is where to go for delicious custom made fresh donuts with a huge choice of toppings. Some of topping ideas that you’ll see there are truly creative, and as the island’s local donut experts they know what tastes great on a donut! It’s a laboratory to create your own donut just the way you’ve always wanted with options such as sprinkles, candy bars, peanuts, coconut, graham cracker, cookies, bacon, fruity pebbles, peanut butter and raspberry drizzle, M&Ms, powdered sugar, sea salt and more. Icing options include chocolate, strawberry, caramel, vanilla, and maple, and the maple and caramel are particularly unique and often requested. It’s also one of the few places where you try out some delectable specialty donuts such as the Sriracha donut made with peanut butter glaze, Sriracha sauce and crushed peanuts. Other specialty donuts include the Key Lime donut and a daily rotating option. This place can often be busy so be ready for a line, but the service is always fast and prices are low it’s so worth the wait! Two Scoops is located near the historic City Pier on Anna Maria Island within walking distance of several of our top Anna Maria island vacation rentals. It is unquestionably a top spot for some of the best homemade ice cream, sandwiches and other desserts that you’ll find on the island at great prices. Here you can enjoy a full breakfast menu served all day with bagels, eggs, English muffins, and waffles. Lunch items include a wide menu of sandwiches such as hot dogs, grilled cheese, ham, roast beef, chicken salad, egg salad, and BLT sandwiches, and so many other options. Ice cream can be purchased by the cone, cup, pint or quart. Dairy, sugar and gluten free choices are available. Flavors include all the standards you expect plus signature options like maple walnut, blueberry pie, sea salt caramel, and others. If the ice cream doesn’t entice you try one of the signature sundaes like the Oreo-licious sundae, Waffle Wedge and Chocolate Decadence. Shakes, malts, floats and fresh coffee and espresso further add to their extensive menu, and don’t forget to pick up a souvenir after your sweet treat! Joe’s Eats and Sweets is located in the historic Bridge Street area near many of our vacation rentals in Bradenton Beach, FL and has been a go-to dessert shop on Anna Maria Island for over two decades. It is known for its extensive range of ice cream and fudge flavors including special options for gluten, lactose and sugar free desserts for those with dietary requirements. 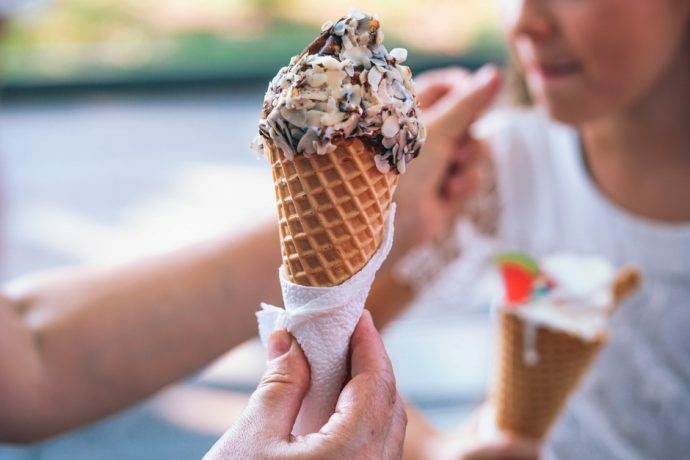 The list of ice cream flavors is vast and just a few of the many that you’ll find there include: key lime, cheesecake, chocolate chip, cookie dough, peanut butter fudge, praline, brownie, and of course the standard vanilla, chocolate and strawberry choices. A more limited selection of sugar free flavors is available, along with fruit sorbets such as raspberry, orange and watermelon. Soft serve ice cream with custom toppings and floats, shakes and malts are also on the menu. There’s also a select lunch menu available at Joe’s with hot dogs, burgers, pizza and other choices whenever you’re craving a bite to eat before your dessert.